In case you hadn't picked up on it, I am making a transition in my life to becoming a full time artist-rabbi. 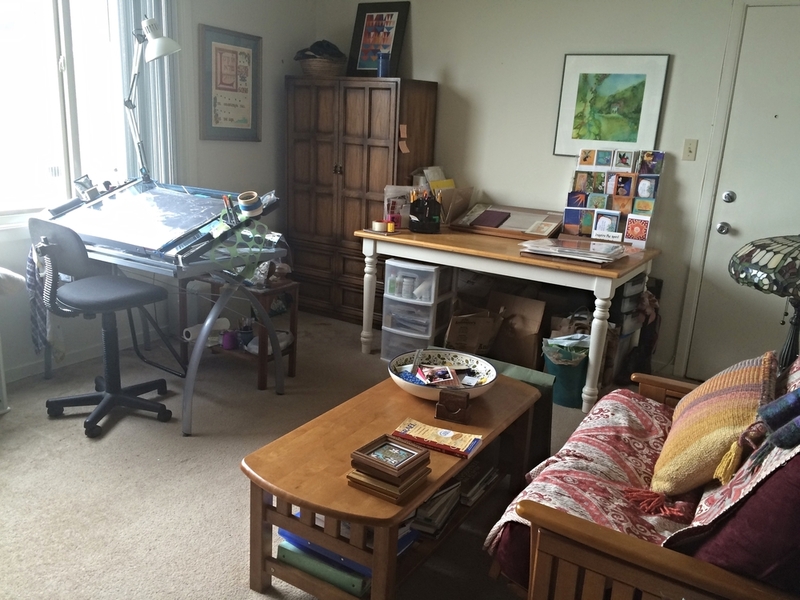 That meant that I had make my little art table* in my home to something more expansive---a studio, where I might feel the invitation to work at on a daily basis. I live in a small apartment in San Francisco, and that meant the only option was to turn my living room into an art studio. Instead of paintings piled up in corners, willy nilly, instead of piles of cardboard boxes, being saved for transporting paintings, I needed some kind of rack. Instead of a makeshift table with piles of art supplies, I needed some sort of organization. At my birthday a couple of months previous, I asked friends not for gifts, but to help me reorganize my space for my new life. My friend Margo, the "handywoman," obtained some bookshelves to remodel into racks, but first, I would need to get rid of a very large, double futon to make space. In using a neighborhood website to offer the futon, I found an armoire I really coveted, with drawers and cubbies to hold my stuff. The futon moved out, and finally, the day arrived in which Margo and another friend, Elliot, who made me a birthday pledge, were scheduled to bring the bookshelves. I ordered dinner delivered that day, as I had a pressing engagement late in the afternoon, and the only window of time the delivery man could come was right when Margo and Elliot would be there. I thought to myself, "This will be chaotic, but I have no other choice." I cleared out the cardboard boxes from the corner, set aside the paintings to make room for the bookshelves. Margo and Elliot grunted and groaned and moved the shelves up the stairs and into place; they proved to serve their purpose beautifully. Margo and Elliot sat down for a cool drink, and I mentioned the armoire. (I had gone to take a look at it, and given the owner a check.) Because they are terrific people, (angels you might say) and because Margo was borrowing a pickup for the day, they said "why not?" and went to fetch it. This, despite their exhaustion, and Margo's date with her husband pressing upon her. They told me to stay home and clear out another corner of the living room, and set off to get the armoire. It was close by...just 15 minutes away. 20 minutes later, Elliot calls me and says they will need another person to get that heavy thing up the stairs to my apartment. Did I know anyone I could call? Frankly, I didn't know any young strong folks near by. They were 10 minutes away! My sister had used Task Rabbit once and was very pleased, so I downloaded the app, and began entering a request, which was going to cost me $60+. Oh Well. That's what comes from spontaneous non-planning. I heard Margo and Elliot's pick-up pulling up as I was anxiously trying to enter my credit card details into task rabbit. The app was telling me I had the wrong CV code on my credit card. I didn't. "OK, try a different credit card." They were out of the truck, unloading the armoire onto the sidewalk. The app was telling me my zip code was incorrect. It wasn't. I was frantic. I ran out the door to talk with them...and a my phone alerted me that a text had come in. The meal delivery man, Mohammed, was arriving shortly. I ran down the stairs, and the delivery man, a young, strong, man, on his way up, Margo and Elliot and the armoire on the sidewalk. "Listen," I said to Mohammed. "I'm going to ask you something a little strange, and I will pay you, and you can say no, but would you be willing to help my friends move this piece of furniture into my apartment?" "I'm happy to pay you," I repeated. He looked at me seriously. "Oh, You know, were aren't supposed to do things like that....but sure! I'll help you!" The relief I felt was enormous...but the best part is yet to come! I heard them grunting and groaning up the stairs...Margo saying, "Oh my grip is slipping! we have to set it down..." The armoire and its carriers rounded the bend through the front door, into its new corner, and there were great sighs all the way round. I ran to get a $20 bill and tried to hand it to Mohammed. "No, no," he brushed my hand away. I swear I tried three times, and he would have none of it. "Well if he won't take any money, give him a blessing!" Margo belted out. I turned to him. "I'm a rabbi. Would you like a blessing?" "Sure!" he said. "I'll take a blessing!" I reached our for his hands, and with Margo on one side, and Elliot on the other, as witnesses, I blessed this angel who showed up at the precise moment of our need, for his great generosity...that this generosity be returned to him and for generations of his children after him, for his kindness and thoughtfulness and open spirit, that he have health, strength and a long life...." Margo and Elliot exclaimed "AMEN," Then the angel dropped off the meal, and left. *The little art table is a fantastic tool, given to me by my son Noah some years previous.